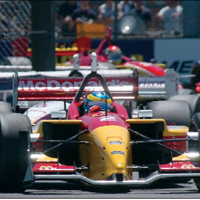 Newman/Haas Racing uses the ADAMS/ Motorsport toolkit and ADAMS/Insight for vehicle system modeling and design of experiments (DOE) to optimize the setup trade-offs required to deliver a more competitive car. The methods provided by MSC.Software have produced a more intuitive understanding of the model and significant gains in runtime, and helped Newman/Haas Racing discover opportunities to further improve efficiency and output. Using test chassis set-up options in a virtual environment, Newman/Haas Racing can take best advantage of limited on-track practice and testing time. With a winged, ground-effect racecar producing a large amount of downforce, a constraint for a given spring rate and static ride height must be set high enough to avoid excessive contact with the ground at high speed. Conversely, for a given spring rate, the static ride height must be set as low as possible to produce maximum downforce. Therefore, the design space results in a band matrix factor that defines the area of normal operation and combinations not physically possible and not meaningful. Correlation between physical test data and analysis results ensures models represent the real world. ADAMS/Insight for vehicle and system modeling has proven to be an effective tool for efficiently producing a complex yet quantifiable understanding of model behavior. These methods have produced significant gains in runtime and understanding.